In my Medieval Lit class, we’re focusing on manuscripts for the next few weeks, and so I thought I’d turn my class loose with Recap and some introductory videos on MSS to see how Recap works. At the upper right of that screen is the ‘Add Recap’ button, which allows you to write questions for your students to answer and you can set the length of max response (2 mins max). When I first started writing the questions, I was sticking to largely objective questions (because they were the ones that came to mind) but I realized that it seemed somewhat wasteful for students to record answers to objective questions (though I was happier with the video responses to those questions than I expected; more on that below). As I went on, however, I made more open-ended questions, including questions that required physical props; this, it would seem, is the real advantage to Recap, is the ability to hold before the camera in a dynamic way objects to enhance a response. You can see too that students are able to rate their understanding with a simple visual key and student videos are available for watching at the bottom. In the end, I’m always trying to assess whether a new tool like this has staying power. Is it an effective tool for me and my students to make more efficient and more successful my teaching and their learning? The easy answer is I don’t know. They were initially skeptical (at best) of videoing their answers but, once they got used to the idea, they produced good responses in a more natural and comfortable way. I enjoyed listening to the answers because their personalities came through. And even for the objective questions, which, as I said above, I felt like was a bit of a waste for this kind of format, it seemed like they had a better handle on that objective information than they would have if they were writing it down, filling in a blank, etc. I will try to do circle back to this information later to test that sense, but that was an initial impression. So a good first foray. I think finding the right kind of assignments for this is important, but I’ll continue to experiment with it. 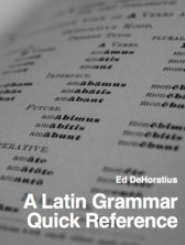 I’m excited to try it with Latin because I feel like it could be a good way to get more students involved in a more natural way for open-ended material, i.e. students can interpret text, offer different readings, speculate on grammatical usage, etc., in what feels like a much less pressured environment (the video response) than in front of the whole class.